View analytics on a per-VM basis to identify rightsizing opportunities across your environment. Quickly identify oversized, idle, and heavily used VMs. You can take further optimization steps by reviewing VMs that may be experiencing high CPU ready times, VMs that span NUMA nodes, or VMs with unnecessary reservations. We often deploy virtual machines intending to use them for a specific purpose and specific time duration. Many of these workloads are intended to be replaced or powered off after their initial use. We may also find that we just don’t know what the performance characteristics of a workload may be over time, and so we err on the side of oversizing a VM in our initial definition phase. In an active, dynamic data center environment, these virtual machines can quickly become lost in the noise of powered-on virtual machines. Over time, these lost virtual machines may move from active to idle and quickly become forgotten. Such forgotten VMs can contribute to a lack of available resources, or worse—resource contention. 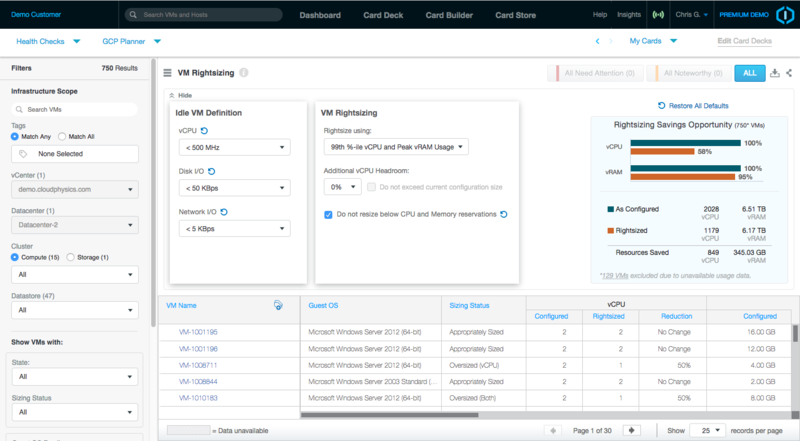 The CloudPhysics VM Rightsizing card aims to help you identify workloads that can benefit from correcting the allocated resources based on actual utilization. These workloads may perform just as well with a reduction in CPU and RAM, while releasing resources for others to consume in the same environment. Apply these savings to more than just your resource optimization. The additional benefits of reduced CPU and memory contention can also potentially improve application response time and user experience. Take advantage of long-running statistics and show your application owners what they are really consuming, guiding them to realistic resource requests for deployed applications. In an environment where charge-back is applied, these minor adjustments could lead to significant savings for a line of business or organization. Take advantage of these analytics and rightsize your virtual machines today!